On November 13, Común Kitchen and Tavern continues its monthly dinner series where Chef Chad White invites a guest chef to team up with him in preparing a multi-course, price fixed meal for ticketed guests. 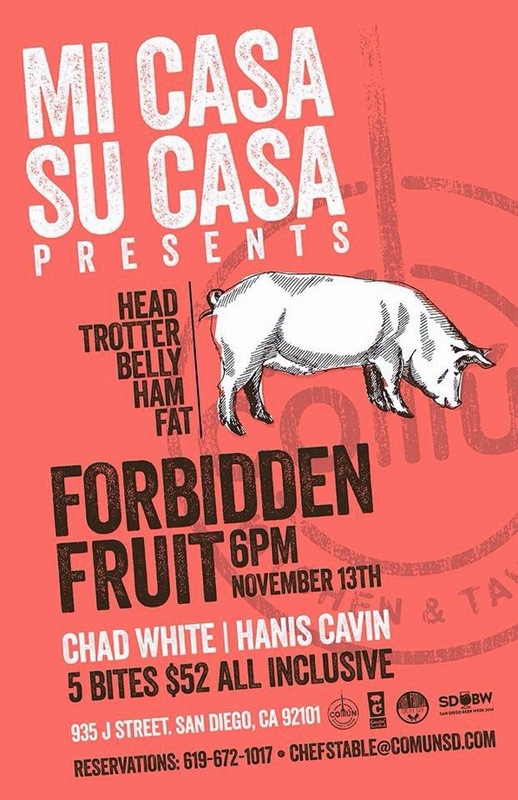 Entitled Mi Casa Su Casa, the next event will be a pork bonanza as Chef Hanis Cavin of Carnitas' Snack Shack will join Chef Chad for 5 courses of piggy pleasure. This is a meal not to be missed. Chefs Chad and Hanis will butcher a whole hog inside Común then proceed to use it in 5 different dishes focusing on the head, trotter, belly, ham and fat. Usually with Mi Casa Su Casa dinners, cocktail pairings are offered at a nominal cost, but this time Común is partnering with Julian Hard Cider to offer cider pairings for this dinner at extra cost. Previous Mi Casa Su Casa guest chefs have included Baja Chef Drew Deckman, Food Network Star Chef Nate Appleman, Chef Iker Castillo of Chef Chad's Tijuana gastropub La Justina and Chef Trey Foshee of George's at the Cove. Tickets to the November 13 Mi Casa Su Casa are $52 or $78 with 5 paired ciders. For more information, check out the menu below, visit comunsd.com and follow Común on Facebook.